Hello! Today’s birthday cake is gorgeous and a feat of fondant icing. I’m including two pictures because I think you don’t really get the full effect just from one. It is (as if you need me to spell it out for you!) 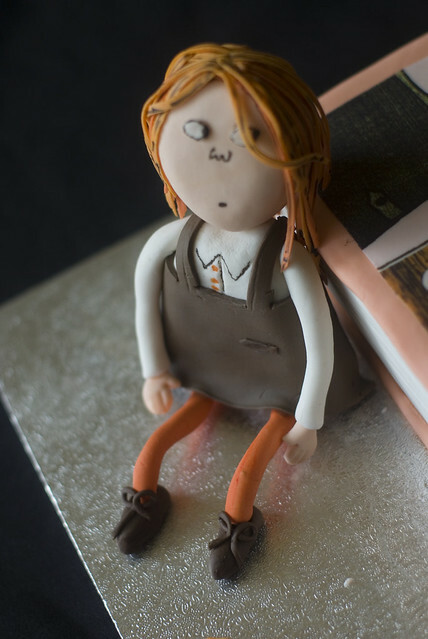 a Clarice Bean cake based on the ACE series by Lauren Child. What I really love about this cake is the innocent expression on the Clarice figure and the HAIR!! I love the detail that’s gone into that one little strand across the eye – it’s exactly how the book has it. Lovely work! Silly old snake, doesn’t he know? Today’s Birthday cake is a ridiculously amazing Gruffalo cake by Creative Cakes by Cat. I found this and genuinely had to stop and just drool for a good few minutes. Look at the grass! And the fox! And the tiny tiny Gruffalo toes! And the gorgeous colouring! And the toadstools! Brilliant 😀 Thank you for letting me feature your cake Cat! As part of my blog birthday celebrations, I decided to write a Choose Your Own Adventure style story and I decided to set it around a birthday party in the fictional school of St Swithin’s. You take the role of a new girl and, as the story progresses, have to decide how to navigate the social nuances of schoolgirl life! I am heavily indebted to this post for technical guidance and inspiration. Writing a story like this is hard – they get so big so quickly! 😀 But I am very pleased I persevered and it was sort of fascinating for me to see the way it developed. It did get a little Star Wars-ish at points (will you choose the way of the Jedi or the Sith?) during the development phase, but I hope that’s not translated too much to the final version. So – here we are. Hyperlinks are underlined and there’s one or more on each page (apart from the ‘Your Adventure Ends Here’ pages) and that’s how you navigate through the story. Hopefully it works and you enjoy The New Girl At St Swithin’s ! PS – Let me know if you can guess which bit in the story was inspired heavily by Enid Blyton! Let the birthday celebrations begin! 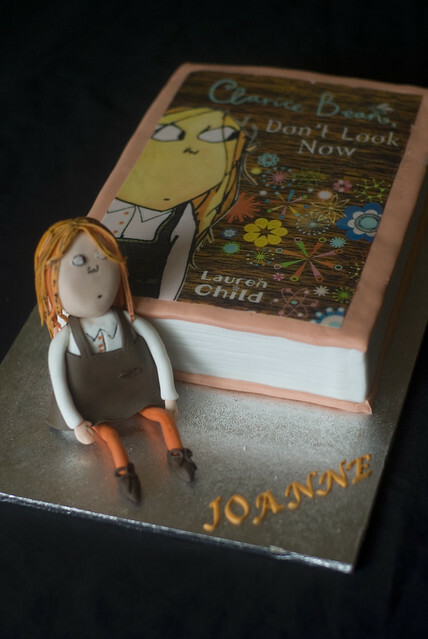 Over the next week or two I will be posting some of my very favourite children’s literature themed birthday cakes! 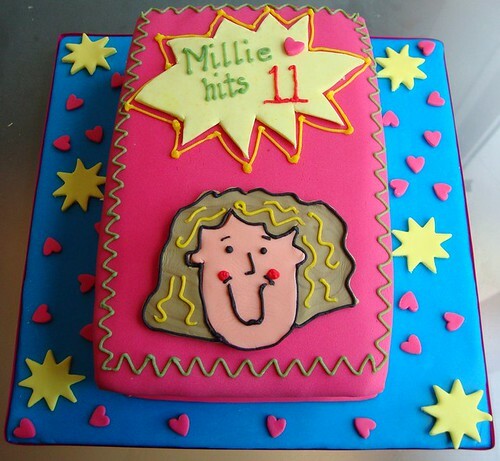 This is my first, and as you can tell it’s a Jacqueline Wilson themed cake! I love how they’ve caught the exact nature of Nick Sharratt’s illustrations and the bright colours that totally characterise his work with Jacqueline Wilson. This is utterly gorgeous and made me very jealous of Millie 😉 It’s by Lisa @ Chubbybubcakes and I am in love with it. Thank you for letting me feature it Lisa! It’s my birthday! And it’s also my blog birthday in about two and a half weeks! So, officially, I’d like to invite *you* to the beginning of my birthday themed posts over the next week or so. We’ll be covering things ranging from the perfect schoolgirl birthday party (clue: there’s lots of food, and if you’re a ‘bad’ girl, it’s all followed by a dose of tummy trouble and a healthy serving of repentance), my favourite birthday parties in children’s literature, perhaps a dose or two of my favourite birthday fanfics, and quite probably a trip to Matron to recover from the festivities. 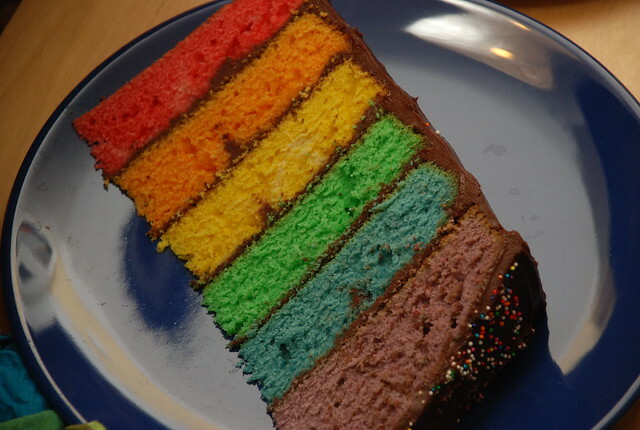 We’ll stop off at some amazing book birthday cake recipes, explore the wondrousness of book themed birthday food and perhaps get a bit giddy on Etsy when the sugar highs kick in and point and flail at something amazing and book related.